Assuaging the fears that sanctions might put a drag on trade with and investment in Russia, business leaders from across the globe have come to St Petersburg to talk over the problems and prospects of economic development and push back the boundaries of cooperation with Russian businesses. France’s Total will not quit its projects in Russia unless EU authorities proceed with the third stage of punishment of Russia over the events in Ukraine and set sanctions targeted against the key sectors of its economy, CEO Christophe de Margerie said at the St. Petersburg International Economic Forum on Thursday. Total holds about 19% in Russia’s independent gas producer Novatek, 20% in the liquefied natural gas project Yamal LNG, and 40% in the Kharyaginskoye oil field in the Nenets Autonomous District. De Margerie said that the company is beyond policies, that is why he arrived to the forum. Projects that German companies are now implementing in Russia have not been placed in jeopardy due to the unrest in Ukraine, a German expert said. “The situation is different with enterprises that are planned to implement new projects in Russia,” Chairman of the Committee on Eastern European Economic Relations Eckhard Cordes said on Thursday. “Naturally, these companies should analyze their positions thoroughly. Businessmen seriously fear that there is a threat to drift to the Cold War times,” he said. “Russia should do anything for Germany to restore trust that was lost during the conflict in Ukraine,” Cordes said. “Russians know that they should create reliable investments conditions if they want to attract foreign capital,” he said. 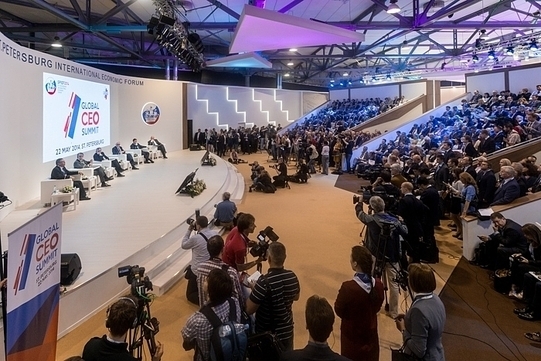 Cordes is participating in St Petersburg International Economic Forum. The European Bank for Reconstruction and Development (EBRD) has no plans to change the strategy of its operations in Russia, Director for EBRD Corporate Projects in Russia Lindsay Forbes said on Thursday. Forbes is participating in the St. Petersburg International Economic Forum, which started on Thursday. Forbes said an EBRD delegation had come to the forum to work on business issues. EBRD President Suma Chakrabarti earlier called Russia a country of lesser priority for the EBRD, without specifying the consequences of a change of priorities. Germany has no possibilities, neither from the technical, nor from the economic point of view, to abandon acquiring natural gas from Russia, Chairman of the Russia-Germany Foreign Trade Chamber Michael Harms said at the St. Petersburg International Economic Forum on Thursday. “We need to set the vector at diversification. But here I will quote a firm position of the Germany’s Energy Ministry “In a short term, there is no possibility to abandon the supplies from Russia,” Harms said. “This approach will also stabilise the political situation in the long run,” Harms added.